The 2004 Platinum Eagle coins were produced by the United States Mint as both bullion and collector coins. Since the second year of the series, the collector coins had been struck in proof and carried an annually rotating reverse design. For the entire series, the bullion coins carried the same reverse design featuring a soaring bald eagle. Throughout most of the year, the market price of platinum was above $800 per ounce, briefly rising above $900. The cumulative average price for the entire year was $845.31. The higher cost per coin seemed to weigh on sales. For the one ounce, one-half ounce, one-quarter ounce, and one-tenth ounce bullion coins, total annual sales set fresh all time lows. 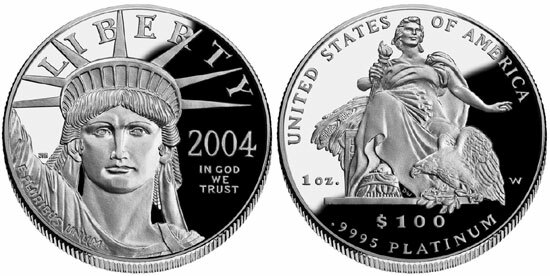 The United States Mint began sales of the 2004 Proof Platinum Eagle on September 16, 2004. In line with the higher market price of platinum, the issue prices were increased for all individual options and the four coin set option by 23% to 25%. The maximum mintage levels were maintained at the same level, and none of the options came close to attaining a sell out. The reverse design for the collector coins was designed by Donna Weaver based on the sculpture by Daniel Chester French titled “America”, which sits before the U.S. Customs House in New York City. 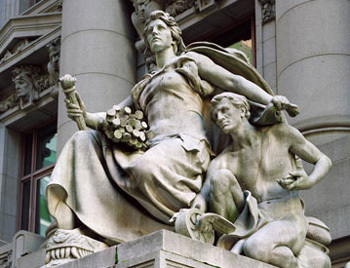 The original sculpture features a seated woman holding the torch of Liberty with stalks of corn in her lap with the figure of Labor crouched at her side. On the reverse design of the coin, the figure of Labor does not appear but instead this position is occupied by a bald eagle.